This recipe is super easy to make and has a real alfredo sauce taste. I was using it as a side dish so I just made a small batch – three or maybe four small servings. 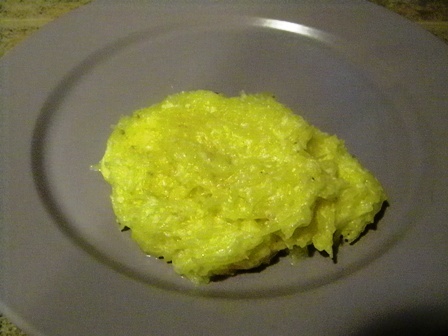 Cook spaghetti squash. My method is to poke a lot of holes with a knife and then microwave it for 9 – 12 minutes (depending on size). Just make sure the wholes are poked all around the squash or it will burst while cooking. After the squash cools cut it in half and scoop out the seeds. Use a fork to pull the strands of spaghetti squash out of the skin. Set aside. In a small sauce pan melt butter with the garlic.When butter is melted add the yogurt and cheese, stir over medium low heat until creamy. This should only take a minute or two. Add squash, salt, and pepper to pan and coat squash with the cheese sauce. Heat squash through and serve. It was hard to get a good picture, but here it is.